Those of you 21-and-older who missed the first Summer Zoomance shouldn’t be upset. You have a second chance! 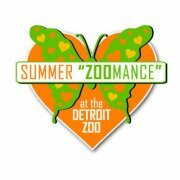 The Detroit Zoo’s second Summer Zoomance is scheduled for Thursday, August 23rd from 6 p.m. to 9 p.m., rain or shine. Guests will enjoy a twilight stroll of their favorite award-winning animal habitats while enjoying food and adult beverages, which can be purchased at Zoo concessions. The event will feature free tram tours, music from the Sun Messsengers, animal enrichment and zookeeper talks. Admission for all guests is $10 in advance and $12 at the gate. As always, Detroit Zoological members will be offered free parking. Parking for non-members will be $5. Tickets can be purchased online in advance at www.detroitzoo.org. This entry was posted in Detroit, Food, Music, Things To Do, Wine and tagged adults, after hours, beer, detroit, drinks, Food, fun, Royal Oak, wine, zoo. Bookmark the permalink.